Kaur, J., Singh, S., Kumar, R., Kanjilal, D., Chakarvarti, S. (2011). Fabrication of Copper and Iron Nano/Micro Structures on Semiconducting Substrate and Their Electrical Characterization. International Journal of Nanoscience and Nanotechnology, 7(4), 183-189. J. Kaur; S. Singh; R. Kumar; D. Kanjilal; Sh. Chakarvarti. "Fabrication of Copper and Iron Nano/Micro Structures on Semiconducting Substrate and Their Electrical Characterization". 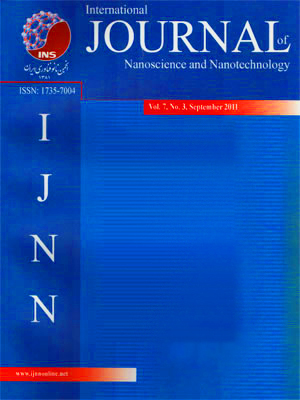 International Journal of Nanoscience and Nanotechnology, 7, 4, 2011, 183-189. Kaur, J., Singh, S., Kumar, R., Kanjilal, D., Chakarvarti, S. (2011). 'Fabrication of Copper and Iron Nano/Micro Structures on Semiconducting Substrate and Their Electrical Characterization', International Journal of Nanoscience and Nanotechnology, 7(4), pp. 183-189. Kaur, J., Singh, S., Kumar, R., Kanjilal, D., Chakarvarti, S. Fabrication of Copper and Iron Nano/Micro Structures on Semiconducting Substrate and Their Electrical Characterization. International Journal of Nanoscience and Nanotechnology, 2011; 7(4): 183-189. In this paper, we have studied the electrical properties of the randomly distributed metallic (Co and Fe) nano/ micro wires on Silicon substrate. Deposition was carried out potentiostatically into the pores of the track-etch polycarbonate membrane spin coated onto the Si substrate. Spin coated films were irradiated with 150MeV Ni (+11) ions at a fluence of 8E7 ions/cm2, followed by UV irradiation and chemically etching in aqueous NaOH (6N, at room temperature). The size, shape and morphology of the synthesized nano/micro structures is strongly dependent on the preparation conditions such as deposition potential, current density, electrolyte and etching conditions. Later, morphological and electrical properties of the so deposited nano-/micro structureswere studied.